PEOPLE reviews NO ONE CARES! Author noonecaresaboutcrazypeople_1y4oqpPosted on March 30, 2017 March 30, 2017 Categories UncategorizedTags author, book, book review, magazine, people magazine, reviewLeave a comment on PEOPLE reviews NO ONE CARES! KEVIN AND “BOOBY” TEAR THE ROOF OFF! Kevin was in a frenzy for us to get to the airport parking garage when I picked him up for the last few days of winter break 2000. He was back home from a visit to his new Interlochen room-mate, who lived Jacksonville, Florida. Kevin had a surprise for me. I left the car in parking gear and we listened as the music started to play. Kevin turned up the volume and then peered intensely at me. The songs were punk. But what punk! Six driving pieces of blazing force and disciplined musicianship—guitar, bass, drums and vocals. I had never been a fan of punk, but this was something else, something beyond. The songs surged forth, alternately seditious, playful, and charged with young-male defiance, typically toward a girl who’d thrown the young male over. “I won’t change myself for anyone,” the lyrics ran, and, “Why do we pretend that we were made for each other?” and “Why did you lie to get your way?” (When Pedant Father suggested a few days later that she had lied to get her way to get her way, Kevin shot Pedant Father a sidelong you-are-so-out-of-it look, and Pedant Father kept himself out of advice-giving after that.) The lyrics contained the requisite quotient of alienated-youth trashmouth; yet the songs were not dark at all. The words seemed to be present mainly to provide a superstructure on which to mold the magnificent music. The longest and best of the six pieces was a fireworks display titled “Epistemological Commentary.” Kevin took his longest solo in that one, and it was out of this world: an intricate display of fast scale-running, up and down and up and down again; but shaped into an exhilarating musical idea. Kevin shifted chords upward near the end, and his guitar turned into a calliope, tootling away in some celestial circus of joy everlasting. I didn’t say anything when it was over and the disk slid out of its slot. I didn’t want to trivialize what I’d just heard with some inane boilerplate comment. I think that I ended up just shaking my head, and putting my hand on my son’s shoulder. The only sound was of the van’s engine humming in the chilly parking lot. Kevin had his lopsided grin working. He nodded. He understood. On New Year’s Eve, as Kevin told the story, the trio entered the soundproofed room, set the volume and tonal controls, and began playing. They recorded and re-recorded and edited throughout the night—a detail that richly flavored Kevin’s fantasy-come-true. By morning they had nailed it. They ran off several copies of the master, with the intention of sending them out to record companies. And they awarded themselves a suitably macho punk band name: Booby. They sent their CD off to several places including an emerging musicians’ go-to website, garageband.com. It took the site about four months to begin posting the songs. guitar line is so damn cool I can barely stand it. . .” and on and on. NOTE: “Epistemological Commentary” is the third track on the accompanying links. I will post the remaining three tracks later. Author noonecaresaboutcrazypeople_1y4oqpPosted on March 27, 2017 March 27, 2017 Categories UncategorizedLeave a comment on KEVIN AND “BOOBY” TEAR THE ROOF OFF! When Kelly Rindfleisch wrote the words, “No one cares about crazy people,” she never dreamed Pulitzer Prize-winning, New York Times-bestselling author Ron Powers would read them. 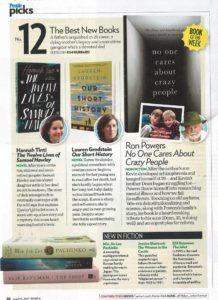 “I cannot describe to you the emotion, the shockwave, that hit me when I read that quote,” says Powers, author of No One Cares About Crazy People: The Chaos and Heartbreak of Mental Health in America, who Kirkus reached at home in Castleton, Vermont. Rindfleisch, who was Wisconsin Governor Scott Walker’s Deputy Chief of Staff, wrote the hateful words in a 2010 email uncovered by the Milwaukee Journal Sentinel. To her campaign colleagues, she mocked and dismissed the depredations of the Milwaukee County Mental Health Complex, where a woman being treated for bipolar disorder died of starvation. Where workers sexually assaulted and impregnated patients. Powers is an award-winning writer with criticism, narrative nonfiction, and biography to his credit. He is the author of Mark Twain: A Life and coauthor of the No. 1 New York Timesbestseller Flags of Our Fathers, which was adapted into a film directed by Clint Eastwood. 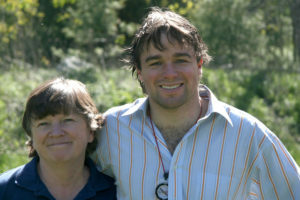 He and his wife, Honoree Fleming, a pioneering biochemist, are the parents of two sons, Dean and Kevin, who were diagnosed with schizophrenia in young adulthood. No One Cares About Crazy People is a treatise on the state of mental health care in America today—how we arrived at the disgust, hostility, and ignorance embodied by Rindfleisch and her ilk. It’s also the emotional story of the Powers family’s struggle with the fearsome scourge of schizophrenia. Powers spent a decade researching nosology, political history, and structures of care and governance of schizophrenia (i.e., how the police and the courts treat the afflicted). In the book, he traces mental health care’s shocking history: from “Bedlam” asylum in London, the scene of centuries’ worth of shocking abuses, through American deinstitutionalization; the deleterious denial enacted by popular figures like Dr. Thomas Szasz, author of The Myth of Mental Illness and L. Ron Hubbard colleague; the noble mental health care initiatives of Presidents Truman and Kennedy and mass defunding by President Reagan; and the consequences for those living with the disease today, bumping up against untrained police, ignorant lawmakers, and fearful neighbors. Megan Labrise writes “Field Notes” and features for Kirkus Reviews. Pulitzer Prize-winning writer Ron Powers draws on heart-wrenching personal experience in writing about the way society treats the mentally ill. 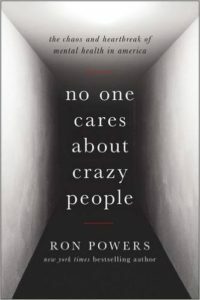 The title of the new book by Pulitzer Prize-winning critic and biographer Ron Powers, No One Cares About Crazy People, is a quote from a disclosed email sent by an aide working in the Milwaukee County Hospital, a line the aide never intended to be made public but that summarizes all too accurately the attitudes – on a personal and institutional level – that Powers encountered in the course of dealing with the schizophrenia that afflicted both his sons while they were still barely into their teens. The worst of that unmerciful world, unsurprisingly, is the world of US prisons – a world that comes into the ambit of the book because of the legal problems his son Dean encounters. “The American prison system is an archipelago of barbarity,” he writes with damning directness. “In many important ways its assumptions and practices bespeak the Middle Ages.” According to a Department of Justice study, more than half of the country’s roughly 2 million prisoners suffer from some kind of mental health problem, and the ruthless squalor of their lives, the criminalization of mental illness reflected in their plight, fuels some of the book’s most scathing prose – as does the anti-psychiatry movement of the late 1960s and 1970s spearheaded by Thomas Szasz, author of “The Myth of Mental Illness,” and by L. Ron Hubbard, the science fiction writer who created Scientology. Ron Powers has earned his right to publish a book as angry and revelatory as “No One Cares About Crazy People” – he’s paid the highest price a father can pay: his son Kevin hanged himself, and it was Powers who found the body (“A dusty little window just under the ceiling,” he writes in the nearly unbearable moment, “on his far side, allowed some weak morning light to play on his hair, not enough to fire up the gold”). He has shaped his pain into a sustained howl of incandescent outrage, a book too heartbreaking to be comforting (despite its glimmers of die-hard optimism) and too uncompromising to be ignored. It’s a book to stand comparison with Sylvia Nasar’s “A Beautiful Mind” but that is in many ways even more powerful, since Kevin and Dean are not math prodigies like that book’s main character but rather are the very picture of normal American boyhood until mental illness darkens that picture completely. “I hope that you do not ‘enjoy’ this book,” Powers writes. “I hope you are wounded by it; wounded as I have been in writing it. Wounded to act, to intervene.” Readers of “No One Cares About Crazy People” will certainly feel that wound, and they will finish the book more convinced than ever of Powers’s central anthem: “Too many of the mentally ill in our country live under conditions of atrocity.” If any book can begin to change those conditions, this is the one. NO ONE CARES ABOUT CRAZY PEOPLE will appear in bookstores today! Author noonecaresaboutcrazypeople_1y4oqpPosted on March 21, 2017 Categories UncategorizedLeave a comment on PUBLICATION DAY! Tuesday is publican day for NO ONE CARES ABOUT CRAZY PEOPLE! Author noonecaresaboutcrazypeople_1y4oqpPosted on March 18, 2017 March 18, 2017 Categories UncategorizedTags book launch, book release, interview, new bookLeave a comment on A BIG WEEK BEGINS! From time to time on this blog, I’ve lamented the uncounted family members—mothers, mostly—who are aware of the hideous abuse their mentally ill children suffer in jails, and sometimes in care centers and by law enforcement; yet who choose to keep their voices muted for fear of stigma and possible retaliation by the abusers. On Sunday I persuaded one such mother to let me share the latest of several testimonies that she has written and posted on a members-only website for families of SMI (serious mental illness) victims. I have withheld her name. It is the details, after all, that matter; not the specific identity. This woman is hardly a malcontent: she is a Sunday-school teacher at her church, has had years of experience as a foster parent (including for refugee children) and is civic-minded in many other ways. What you will read below is not her first plea for help and understanding. Her son has been mistreated in all sorts of unthinkable ways: by the community and by “care-givers” as well as the violent inmate who attacked her son on Saturday night. Our society needs to hear many more such voices: enough voices, and enough response to those voices, to disprove the ironic title of my forthcoming book, NO ONE CARES ABOUT CRAZY PEOPLE. Kimberlee Cooper-West is an unassuming mother, a Sunday-school teacher, and a civic volunteer who lives in a village of about a thousand people on the western border of Michigan, the state where she was born. (Not all that far, as I think of it, from the Interlochen Arts Academy, where my late son Kevin spent three happy years before succumbing to schizo-affective disorder.) Photographs on her Facebook page show her wreathed in family members, or busy at a Catholic charity event. She has had extensive experience as a foster mother. In short, she is one of the countless quiet pillars of community upon whom the cohesion of society depends. It is a pretty safe bet that Kim West has never thought of herself as intersecting with a moment in history. And yet this intersection seems a possibility. Kim West is the woman who a day ago gave me permission to reprint the post quoted at the top of today’s blog: a post that detailed the beating her young mentally ill son Ty endured in a jail cell from another inmate on Saturday night. Kim had submitted her post to a site called the Circle of Comfort and Assistance, one of many “closed,” or private websites whose members are assured anonymity, and who in turn agree not to publish others’ writings without permission. She has been a sadly regular contributor. I came across Kim West’s (latest) essay during one of my frequent visits to the CCA page. I could hardly contain my outrage, even though this kind of atrocity-account is hardly new to me. 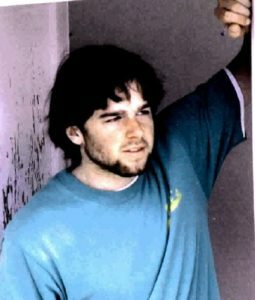 It was the accumulation of cruelty and neglect suffered by the boy that prompted me to intervene: years of unresponsive “care-givers,” draconian court decisions, hostility to the West family from within its community, and a string of prior beatings behind bars.I wrote and asked her for permission to reprint on this blog. I have made similar requests to other contributors in the past; have been turned down; and have honored their understandable wishes for privacy. Kim agreed. And this morning (Monday), she advanced farther out of the cold, into the light. She gave me permission to go public with her name, her family’s location, and more particulars of her son’s horrific–but not uncommon–treatment by the “normal” world around him. Until Kim West, and now Marie Abbott, decided to step out of the cold and into the light—into what James Agee called “the cruel radiance of what is”—calls to action from within the world of the afflicted have largely fallen on deaf, or at least closed ears. Families and friends of the insane do not want to talk about their, and the victim’s, problems. They choose to draw a protective blanket of silence around themselves, for the same reasons of combat veterans have done, and families of cancer victims. The reasons have to do with the dread of stigma and shame, and even reprisal. If I tell the truth about what I saw and did in the war, my buddies will call me a rat. And a crybaby. If I talk about my night-sweats and nightmares and heavy drinking, they’ll laugh and say I couldn’t take it. Coward. And anyway, it’s unspeakable. If I talk about my husband’s cancer or put that into the obituary when he dies, my friends will find it sickening and turn away. Or they’ll think maybe I’ve got it too, and it’s catching. And anyway, it’s unspeakable. If word of this gets out, people will think my daughter is a monster. They’ll think my son is a criminal. Or that I gave it to him. Or they won’t think at all; they’ll just want her put away somewhere, out of sight. They think crazy people aren’t even human anyway. Or bigotry to that effect. This silence has devastated mentally ill individuals, and it has devastated the sub-universe of the insane. The silence has erased mad-people’s human identity and rendered them mere abstractions. What’s the problem with slashing public spending for. . .abstractions? Why be concerned if an abstraction gets beat up in jail, or left homeless, or shot dead in the street? Because of this pervasive self-inflicted silence, the persecution of the mentally ill has not changed in many ways since the opening of Bedlam Asylum. Seven hundred years ago. I am going to be silent no more. This is the way mass movements begin. With a quiet mother deciding, No more. With a mild assistant department-store tailor deciding that she did not want to move to the back of the bus. With a sickly woman visiting insane asylums in Massachusetts and coming back to report on what she had found. With a tiny legal representative decided to march two hundred forty-one miles from the Sabarmati Ashram to Dandi, on the coast of the Arabian Sea, in India, to pound salt. Lest anyone think that the possibilities I’m imagining here are overblown, let us be clear: as I write, the interests—including the survival interests—of insanity victims in America are in extremis. The Republican president and the Republican-controlled Congress seem to have it within their grasp to destroy the Affordable Care Act, and with it, the most important source of funding for hospitals, care centers, doctors, and medications essential to these victims’ continuing status as human beings. The mighty lords of politics in our time could not care less about any of this. It is going to be up to the small, quiet women of our society, the unacknowledged pillars of our little communities, to save the insane. Kimberlee Cooper-West, Marie Abbott—this is your moment. History is waiting. Ballads were Dean’s specialty. Not just playing and singing, but writing them, summoning up the emerging poet inside. During an especially painful period in his young life, Dean turned to the guitar for solace. He practiced technique obsessively. After a couple of years, he and Kevin were performing wonderful duets at bars and coffee houses in Colorado and elsewhere. 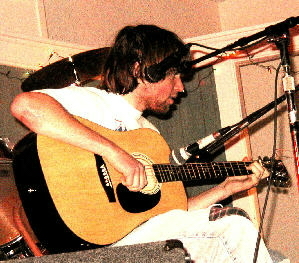 Dean wrote and sang lead; Kev contributed harmony and sublime solos. But Dean recorded (on home equipment) some pieces on his own, pieces that showed strong promise of a career as a singer-songwriter. After Kevin’s death in 2005, Dean put his guitar away and has not played it seriously since. But these three tunes offer a radiant glimpse into what might have been. 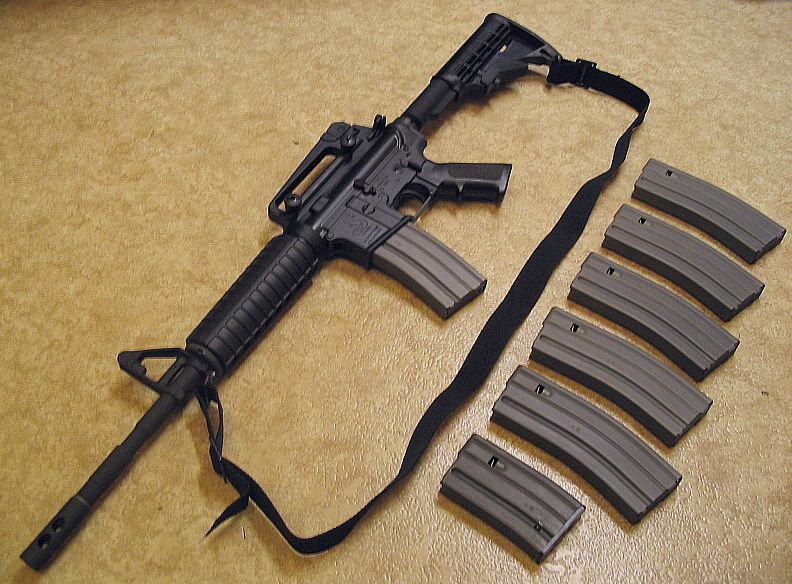 Author noonecaresaboutcrazypeople_1y4oqpPosted on March 7, 2017 March 7, 2017 Categories UncategorizedTags firearm, gun law, gun policy, mental health, politics, sandy hook, schizophreniaLeave a comment on GUNS FOR THE MENTALLY ILL!